I find this software infinitely useful and highly recommend you buy it now unless you have a better “make your own map” solution. In that case please share in the comments section what you suggest. Using this software you can zoom in on any area in the country to help you study motorcycle ride routes and how to get to unfamiliar places. It has a “Find” feature where you can enter a place and let the software find the location for you. You can also view restaurants, gas stations, motels and other important landmarks on the map using built in software functions. I use the software to make my own ride maps. I crop the area that I want to see at the proper magnification that gives me the information I want to see, then I print it on 8.5″ x 11″ paper. I trace my route with a marker and sometimes a highlighter. Then I place it in my map holder on my tank and I’m good to go. This system has been working great for me. Below is my map of the Southern Berkshires; a ride route I read about in Motorcycle Journeys Through New England. I don’t like how the software creates a ride route, so I don’t use that function. It is not user friendly. You have to select many points along the route for the computer to follow the specific path you desire. If you don’t, the software will pick a slightly different route than you intended. If the computer highlights the route for you, in my opinion it makes it more difficult to see the route. Each of the selected data points will be shown which makes the map very cluttered and hard to read. The only good thing about having the computer outline the route is it gives you time and distance information. I’ll stick to my Sharpie for tracing the ride route! Another thing I don’t like about the software is it comes on DVD. My computer has a DVD drive, but Diana’s does not. She is bummed she doesn’t have the software on her computer. Before we got this software we had our own method to make maps. Diana would print about twenty sections of the ride using Map Quest. She would print out the little maps which were about 5″ x 6″. We would have to trim them out of 8.5″ x 11″ paper with scissors and tape them together like a big puzzle. It was a big arts and crafts project to make a map this way. I like this software for the simple function of zooming in on an area I’m interested in and printing an 8.5″ x 11″ map with the option of printing it landscape or portrait. For our Connecticut trip I had maps of the local HD dealership, my friend’s neighborhood, our Motel, restaurants and of course our ride routes. I was prepared to navigate anywhere we needed to go. I did not have that I’m lost because I don’t know the area feeling. The enlarged blowup sections of local roads is so much more helpful than a Road Atlas or traditional street map. Let’s say you’re going on someone else’s ride and you are unfamiliar with the area, or you are going to help lead a Poker Run. All your friends give you is a list of turn-by-turn directions. You can get on your computer and print out detailed maps and you are prepared for anything! There is no way you will get lost. If your motorcycle breaks down, you can let your friends go on ahead and you can catch up with them later. I highly recommend you bust out $40 and buy this! 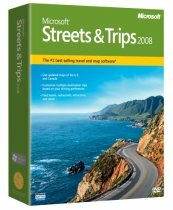 Anyone who likes to plan trips will find this software helpful. I think it is especially helpful for Road Captains. Click here for more information on this very useful software. Not everyone has a PC, won’t work on a Mac. That sounds very cool. But I have to admit that the arts and crafts map project sounds fun too, lol. Google Maps works good for me. I can switch to satellite mode to see if a road is paved or dirt. Otherwise, maps take all the adventure out of riding. It’s more fun to pick a road, follow it, and see where it takes you. This sounds like a great product! We may have to pick this up for next summer when we start riding up north. Thanks for posting! PS…I did think the arts & crafts stuff sounded fun, but this sounds much more convenient! Steve, I know you like the spontaneity of taking off with a buddy or two to uncharted roads but you also lead quite a few group rides also. I thought you would have a higher regard for maps and planned routes than you imply here. I rarely like to be lost, but I have experienced that good lost feeling at least once. Don’t like that it comes on DVD? You can download the new 2009 version. Check out the 60-day free demo, too, before you buy.